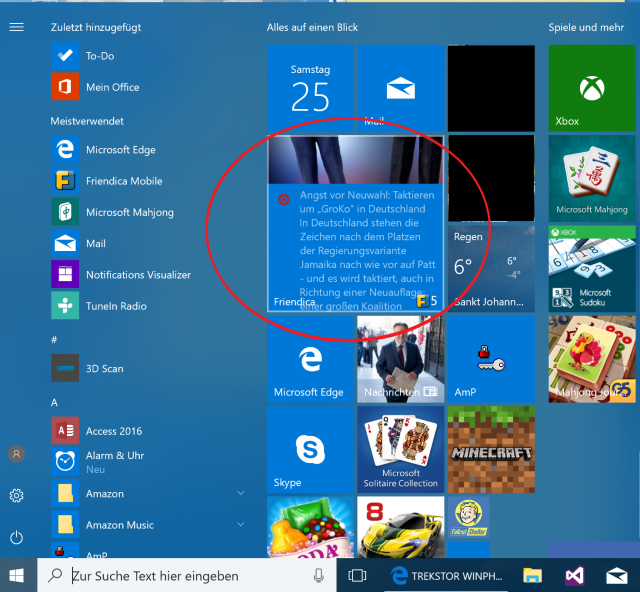 the unique element of Windows (Mobile) distinguishing it from Android and iOS is the use of live tiles in the start menu, showing content from the app to the user without running the app. Friendica Mobile now shows you up to five of the newest unread RSS feed posts as live tiles in the start menu, if you have activated to receive only one notification when new RSS feed posts arrive on your server (Settings/Notifications). You will need to enlarge the app icon to medium, wide or large to see the content. The image is showing the large tile in action, displaying a post from ORF online RSS feed. It is just flipping from the image included in the post to the text. There is no communication with Microsoft servers, the app is asking your Friendica server on new posts in the background and provides the information directly to the tile. I hope you like this nice feature.